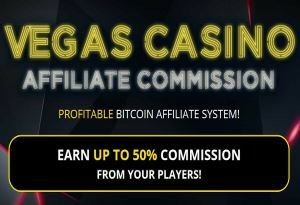 VegasCasino Affiliates is the affiliate program that promotes the online Bitcoin casino property known as Vegas Casino. VegasCasino prides itself in providing players with an exciting casino experience that is second to none. This casino offers players a range of games powered by the likes of Betsoft, Novomatic, Play’n’Go, which are among the most respected software development concerns for providing online casinos with gaming software platforms. All the games offered are available at the click of a button, from a remarkable choice of over 200 various virtual and live gaming titles. Players are also able to access a mobile casino by way of their tablets and smartphones. The VegasCasino operates under a license issued by the government of Costa Rica, and even better, the casino accepts players based in the US. As a matter of fact, there are no restrictions for any countries. However, before playing, players should ensure that online gambling is legal within the jurisdictions they choose to play in. Affiliates are always advised to be clear with the business terms of a program’s structure whenever doing business with any affiliate program. For the VegasCasino Affiliates, partners earn commissions from the traffic that they send to the Vegas Casino brand each month. This typically means the affiliate will get a percentage of the casino’s net revenue which has been generated from the players driven to the casinos plus their wagers. Operating a six-tier payment structure, the revenue share plan is tied to player volumes. As such, an affiliate starts at a 25% commission of the revenue share, which naturally increases depending on the increasing number of players the affiliate refers to Vegas Casino. The tiered structure pays out commissions of between 25% and 50%, with the high percentile payout accounting for more than 100 player referrals every month. Essentially, the return percentage of the revenue share will increase as long as the affiliate’s player quotas remain on the upward curve. The program packs no negative carryovers, which means that affiliates get to begin at zero on the first day of the following month when the balance is in the negative. There is no bundling either since the program only represents one online casino. Affiliates partners may also opt for the CPA payment structure which pays a flat rate for every qualifying player referred to Vegas Casino. The commission paid which varies by product and market can be discussed with the affiliate support team. The VegasCasino Affiliate program has no sub-affiliate structure at present. All commission payments from VegasCasino affiliates are processed within the first 5 days each calendar month. There is an administrative cost of 20% charged on the payouts and all affiliates receive payments in Bitcoins. The commission that is calculated every end of each month is swiftly paid as long as the affiliate meets a minimum threshold of 50 mBTC. Additionally, there has to be at least 3 active players during that running month. Due balances which do not meet the minimum threshold are carried over to the next month to be paid when affiliates can hit or exceed this minimum threshold. All commissions are paid through the player account that every affiliate operates upon signing up with the program. The VegasCasino Affiliates program is among the emerging structures that power their programs using a proprietary software platform. This platform offers affiliates marketing material, text links, banners and other promotional materials. It also provides a slew of reporting tools so that affiliates can peruse their accounts’ statistics in order to evaluate their progress and know how to optimize on their performance.